People are led on a tour group at the campus of Harvard University in Cambridge, Mass., Thursday, Aug. 30, 2012. Some of Harvard's newest members are already guilty of academic dishonesty, according to a recent survey. 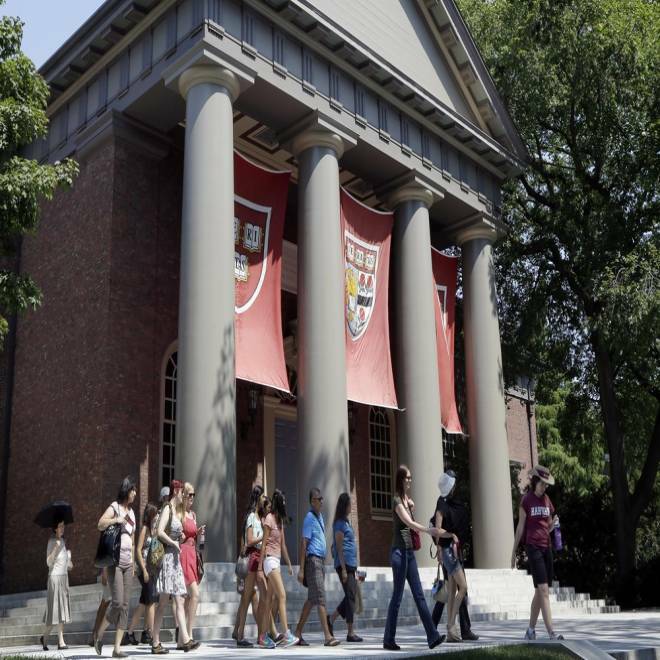 Ten percent of Harvard’s incoming freshman class recently admitted to cheating on exams prior to heading to the Ivy League institution, and another 42 percent admitted to cheating on a homework assignment or problem set, the university’s school newspaper, The Crimson, reported Thursday. The Crimson discovered that recruited athletes were more likely to admit to cheating: 20 percent of freshman athletes admitted to cheating on an exam, compared to nine percent of students who were not recruited to play a varsity sport; and 26 percent of recruited athletes said they had cheated on a paper or take-home assignment, compared to 16 percent of non-recruits, the paper reported. Samuels said more than 1,600 freshman from the class of 2017 were emailed the 10-minute, 60-question survey last month. An estimated 80 percent responded to the survey, he said. “We were lucky to have a very high response rate,” Samuels added. The school newspaper discovered that the incoming class reported higher rates of cheating than Harvard’s class of 2013, as determined by a Crimson senior survey conducted last spring. The survey also discovered that men were more likely than women to report having cheated, according to The Crimson’s website. This recent data collection is the first part of a series The Crimson is releasing, Samuels said. Parts one and two were released earlier this week and delve into the demographics of Harvard’s incoming freshmen with regard to sexual preference, post-graduate expectations and family income. Samuels said he has yet to hear from university administrators with regard to the survey. In an email to NBC News, Jeff Neal, Harvard's senior communications officer, said the university has established a committee made up of faculty, staff and students to address the issue of cheating, which "is a national problem in American education," he wrote. “While the vast majority of Harvard and other students do their work honestly, beginning this year Harvard College has implemented a new, more robust strategy of communicating with all students, particularly first-year students, about the importance – and the ways to achieve – academic integrity,” Neal wrote. Neal declared that Harvard continues "to beat national averages in reports of cheating" and that the university aspires to strengthen their "culture of integrity."